Once again the Trove digitised newspapers have helped me out. A casual search of “Mortimer” in The Portland Guardian threw up the death notice of Henry Mortimer published on September 13, 1948. Henry Mortimer was the younger brother of Mary Mortimer, my gg grandmother who married William Hadden. Henry was born at Cavendish in 1868 and married Sarah Ann Duggan in 1887. They had four children, Edwin, George, Queenie and Lillian. Queenie died as a baby. In 1898, Sarah died leaving three children under 11. The following year Henry remarried to Florence May Hardy and they had a further eight children, Grace, Amy, Beryl, Lance, Gilbert, Gwenda, David, Frances. Florence died, in 1915, possibly as the result of the complications of childbirth as David was born in the same year. She was only 38. Up to that point, I had found that of the female children, Lillian had married Leslie Quarrel, Grace married David Wilson, Amy married John Taggart, Beryl had passed away as a baby and I had not found a marriage for Gwenda. When I found the notice, there were two things that stood out. Olive (Amy Olive on her birth record) was not married to John Taggart and Gwen was married. Olive was also known as June Olive just to complicate things. I had previously found her married name, Taggart, via the death records and on the Australian Electoral Rolls, where I found John William Taggart’s full name. Who then was C. E. Cara? 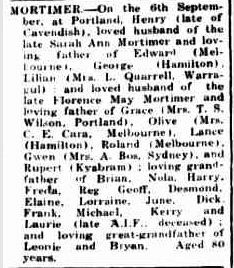 Another search of the Australian Death indexes found Clarence Edgar Cara who died in 1947, while a further search of Trove found his notice of probate. This was most interesting and lead me to the National Archives of Australia site to search naval records. I found him there as a member of the Royal Australian Naval Reserve with the rank of Lieutenant. It shows Clarence was born on June 11, 1899 at Penzance, Cornwall (this brought visions of rollicking pirates!) and his wife was listed as June Olive Cara. At the time of his enlistment in the Reserve, they were living at 65 Victoria Street, Sandringham. By the time he died in 1947 they had moved to 11 Ebden Avenue, Black Rock, where June later lived with John Taggart. It states that Clarence had died on April 6, 1947 but no reason was given except that Repatriation had accepted that his death was due to the war and that June would receive a pension. A Google search of Clarence Cara found him on the Australian National Maritime Museum website. It listed the registration of Clarence’s Certificate of Competency on December 31, 1920 in Adelaide. I thought I would search Trove for John Taggart. I found his and June’s engagement notice. June was proving she was not one to settle for the local Portland lads. Her fiancé was not just John William Taggart but Captain John William Cray-Taggart of London and Rangoon! I also found two notices of Hotel transfer in The Argus. 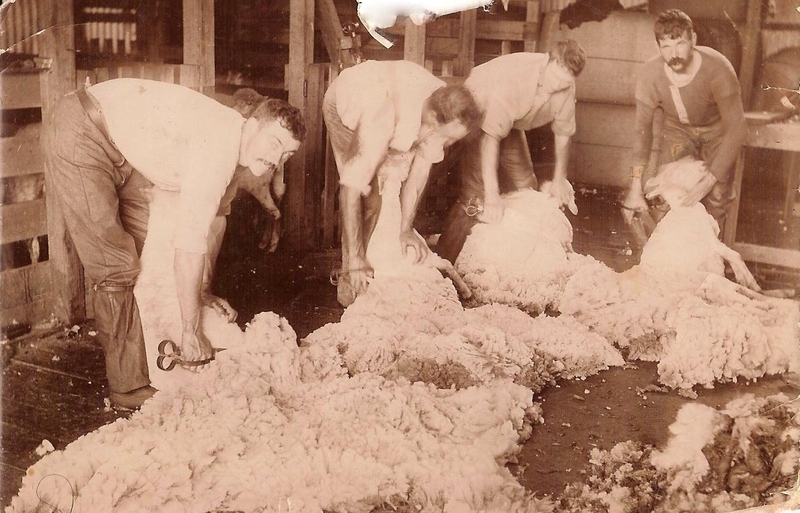 The first was the transfer of the license of the Yambuk Hotel to John and June in 1950 and the second was the transfer of licence for the same hotel in 1951 by Olive and John to Phillip Harrison. The 1954 Electoral Roll finds them at back at 11 Ebden Avenue, Black Rock and John’s occupation was listed as Saloon keeper. Gwendoline Lorna May Mortimer was and still remains difficult to find. She was born in Hamilton in 1908. My next encounter with her was the 1931 census, where she was living at the Homeopathic Hospital in South Melbourne which in 1934 became Prince Henry’s Hospital. Her occupation was home duties. Henry’s death notice gave the lead to the surname Bos. I found Gwen on the 1942 Electoral Roll living in Brighton but no other person with the name Bos at the address. Again in 1954, she is the only Bos living at 24 Spencer Road, Killara, New South Wales. There are , however others with the Bos name living in the area. After searching death records, Trove and WW2 records, I still have not found Mr A. Bos. I am suspecting that he may not have enrolled to vote. I am leaning toward an Abel Bos who died in Victoria in 1970. I haven not been able to find Gwen’s passing. But the search continues. Without Henry Mortimer’s death notice, I would not have discovered much of this. I would not have known of June’s (Olive, Amy) first marriage or of Gwen’s marriage to Mr Bos. Aside from this Henry’s notice offers the place of residence for his children at the time of his death and names of his grandchildren and great children that would have been difficult to find otherwise. From this information, further searching of the newspapers has given me leads to Naval and hotel records and more. Thanks again Trove! This entry was posted in Miscellaneous and tagged Bos, Hadden, Mortimer, Taggart. Bookmark the permalink.